This is a paved walkway with more people and dogs than you can count. I'm posting this as a note to other riders that this barely qualifies as "biking." :) Very pretty, though, and wonderful for people either learning how to ride a bike or for those in the later years just looking to stretch their legs. Paved roads, some dirt and sand, and the occasional off-shoot into the woods for an an eight of a mile. Review: Unless this is your first time on a bike (literally), don't go. 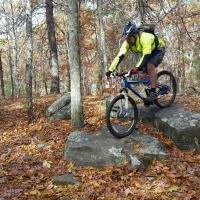 Fresh Pond Loop MTB Trail 1.00 out of 5 based on 4 ratings. 4 user reviews.